A Shadow Rock 2 a legjobb választás a prémium CPU hűtők között a kimagasló teljesítménynek és a kategóriát megszégyenítő árazásnak köszönhetően. A teljesítmény és ár lehető legjobb kombinációjáért a prémium CPU hűtők kategóriájában a Shadow Rock 2 a tökéletes választás. 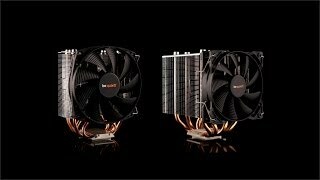 Shadow Rock 2 offers a remarkably high cooling power for all kinds of systems with an impressive rating of 180W TDP. The four high-performance 8mm heatpipes carry heat to optimum locations on the cooling fins. The turbulence-reducing wave design on the fins reduces noise generated by the airflow. This combination of premium features is unmatched. The Shadow Rock 2 provides extremely low-noise operation. Its silence-optimized 120mm be quiet! fan with PWM function delivers the best balance of cooling performance and quiet operation. Highly versatile and functional: With a square, single-tower design it saves space and permits fan mounting in any of four directions for the best heat convection. You can freely choose the fan mounting point, which is especially important for AMDTM users.